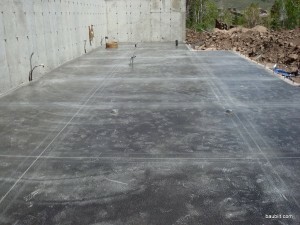 The flatwork guy (Gough Concrete) poured the lower-level slab on Thursday and saw-cut the control joints on Friday. I stopped by on Saturday to take a look. We used a 2% mix of Solomon liquid color, which they call “smoke.” It’s just right. The tint is significantly darker than natural concrete, but still comes across as gray, not black. 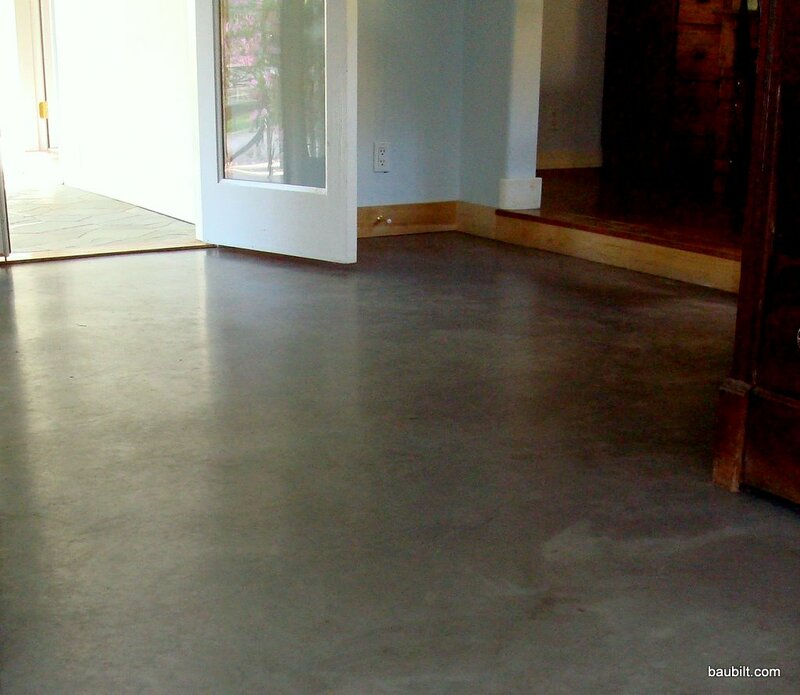 This color in this concentration costs $39 per cubic yard of concrete. Given that the mud itself only costs $110 per yard, that’s pretty significant. 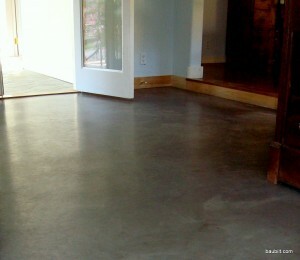 However, given that for this I get a finished floor, I consider the tinted concrete a bargain. This floor cost $5.40 per square foot for everything (#4 rebar, pump truck, concrete, tinting, placing the concrete, finishing the concrete, coating with an acrylic sealer, and saw cuts). 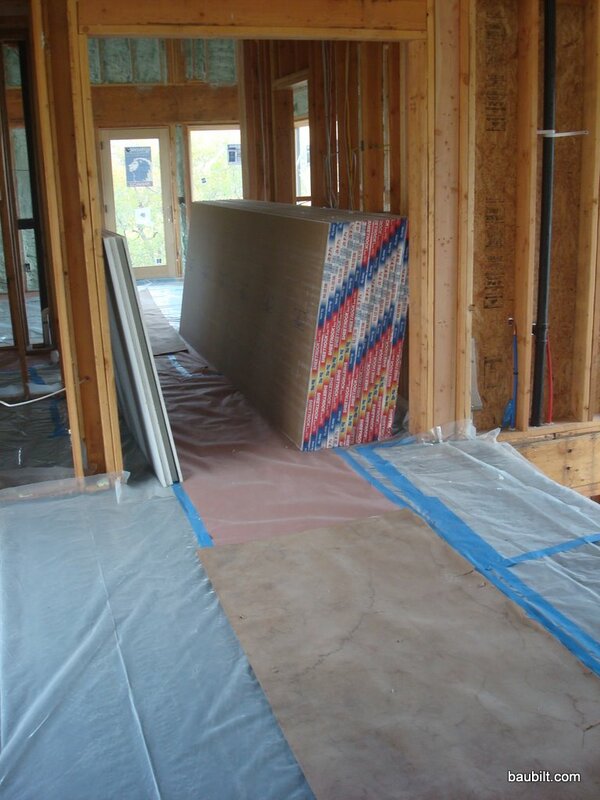 This did not include the 15 mil vapor barrier and the under-slab insulation, which my plumbing and heating guy did. Drywall is a pretty amazing trade. It goes like this: (a) a truck with a big boom on it lifts 40,000 lbs. 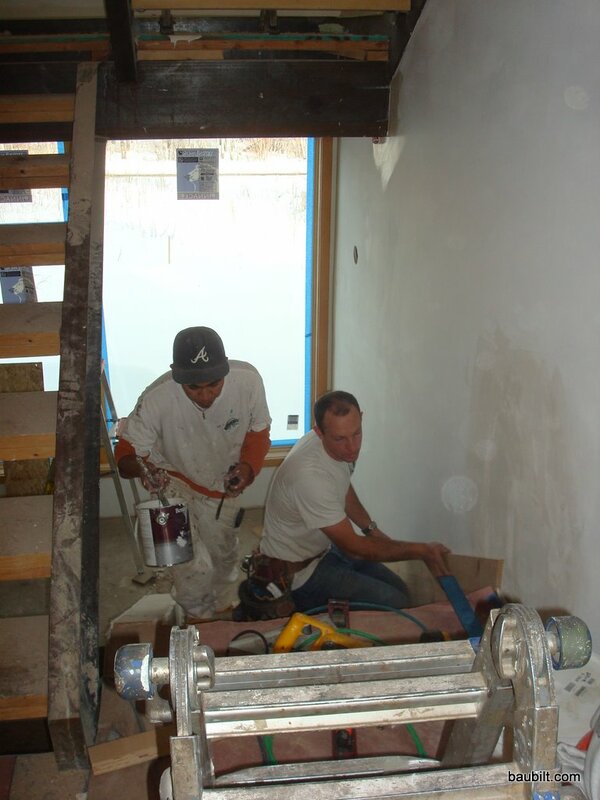 of limestone into the house (sandwiched between two layers of paper in the form of drywall) , (b) 8 guys descend on the project and in two days “hang” the sheets, (c) a different load of guys show up and tape the seams and finish the surface to deliver nice smooth walls. 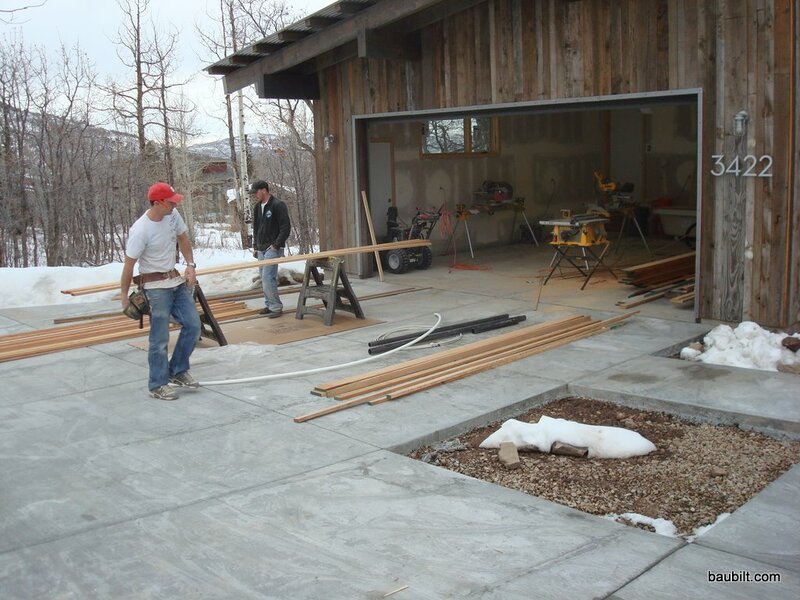 This all happens for shockingly little money; the whole process costs less than $1/sq-ft of surface including materials and labor. Better hope the engineers calculated the loads right. This must be 10,000 lbs of drywall. Picking tile is brutal. I hate it. There must be a million options…in a single showroom. 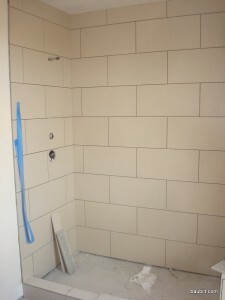 I decided to focus on a nice simple tile scheme and to pick a simple affordable tile. I concentrated on the American Olean line, as they have a little bit of everything and they had a good display in the tile showroom. Fancy tile is $40/sq-ft. Tile at Home Depot is $2-3/sq-ft. It’s all the same material, basically. So, the trick (for me) was to find a mainstream tile that could be used in an elegant contemporary design. 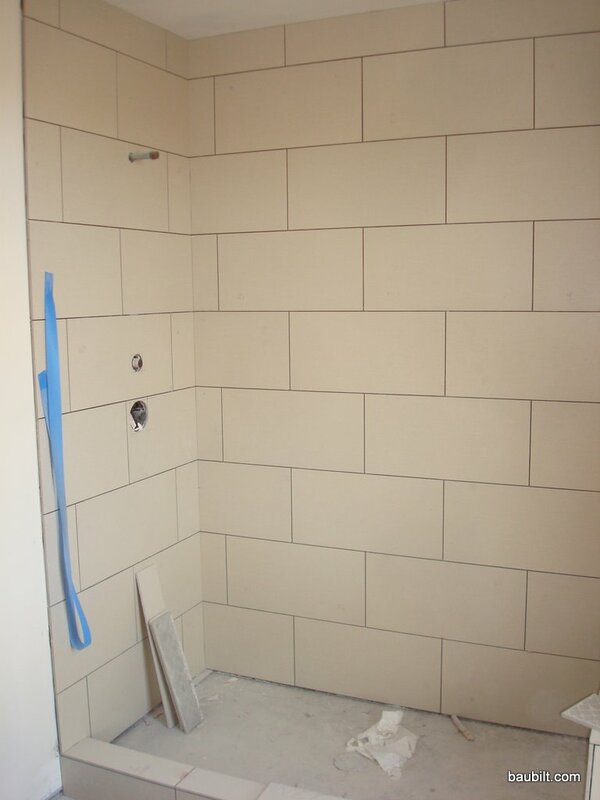 For all the showers, I ended up with American Olean St. Germain in “Creme.” I used the 12″ x 24″ tiles laid up in brick pattern. Here it is being laid. I love it. 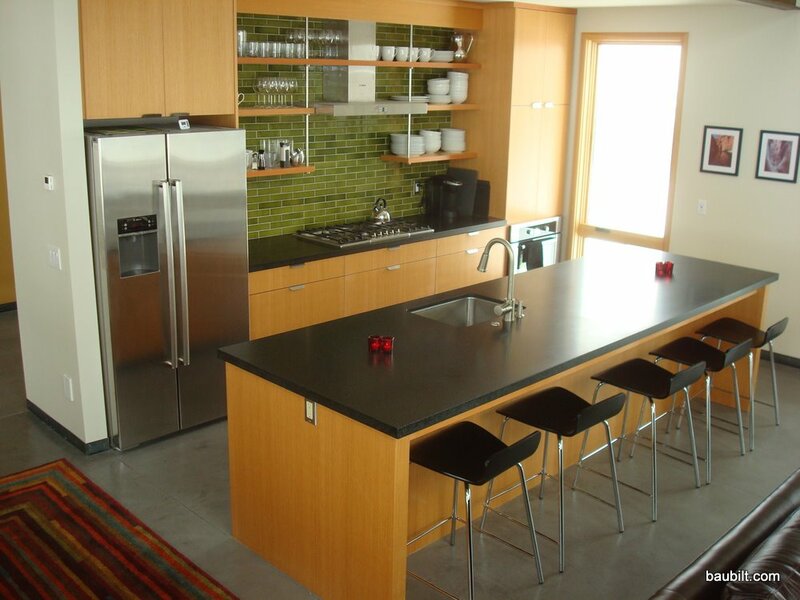 It’s crisp, clean, and contemporary. It ran about $4.50/ sq-ft for the material. 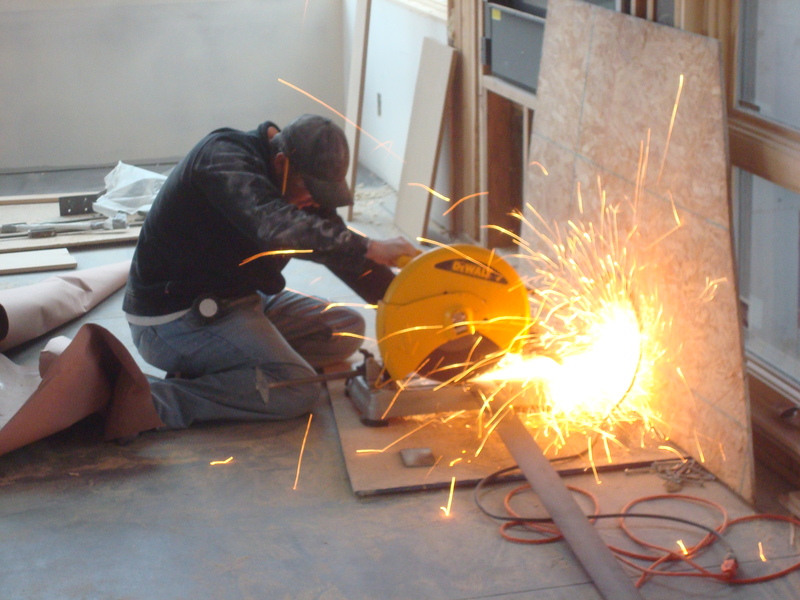 My tile guy is very high end…he charges about $12/sq-ft for installation. But, I didn’t want to mess around with quality on this. American Olean St. Germain in Creme color in 1ftx2ft size. The wood ceiling in the great room and master bedroom is 1×6 clear mixed-grain hemlock. 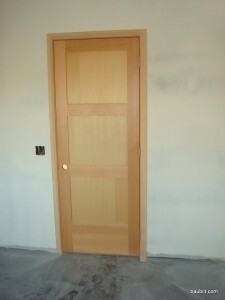 I had it prefinished, so the finish carpenters just pin nailed it in place, filled the nail holes. It’s then done. No one has to get up there again. This material is not cheap: $1.72/linear foot for the material and $0.67/linear foot for clear finish. 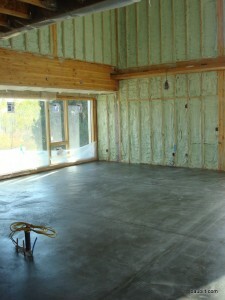 So, this comes out to about $5.50/sq-ft of finished ceiling for material, including about 10% waste. 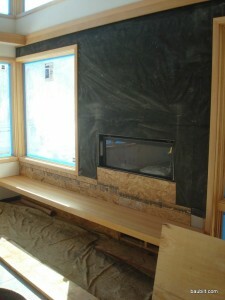 My finish carpenter, Eric Epps, first stapled up black landscape fabric (cheap). I had him leave a 3/8″ gap between boards. This gives a nice linear effect. Everyone loves this ceiling. 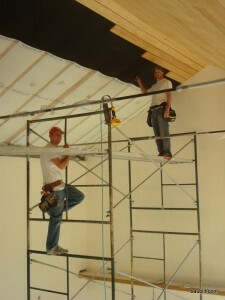 Eric (near) and Spencer installing 1x6 hemlock over black landscape fabric. Tile is hard to choose. Paint not quite as bad. Still, there are lots of choices. 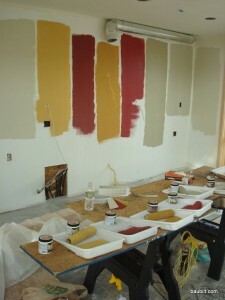 Test wall for paint colors. I did this where the kitchen cabinets will go. These swatches are hard to cover well, so the painter prefers you use a wall where it won't show. I saw a nice wall made by the Lucky Dumpster which was a mosaic of barnwood pieces. I had Trestlewood mill up a variety of colors of barnwood into tongue-and-groove “flooring.” Eric, my finish carpenter, then installed the pieces on the family room wall. It’s excellent. 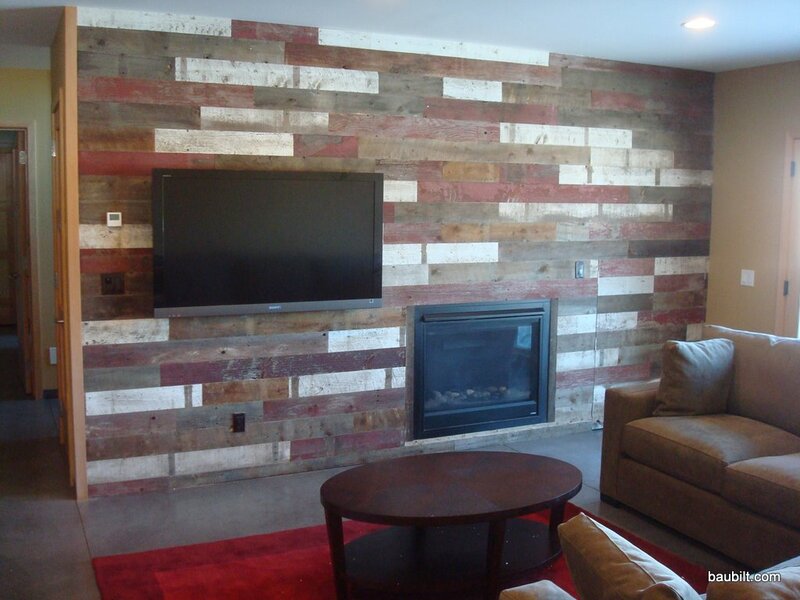 Barnwood wall with TV mounted. I fed the cables through the wall directly into the a/v closet under the stair. Making blank walls visually interesting is a challenge. Here’s one idea that worked out very well. I was inspired by the arrival in the mail of my son’s thick catalog of skateboard decks. 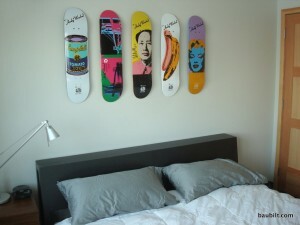 We found a cool collection of Warhol images on decks and bought five of them for a total of less than $200. Here they are on his wall. 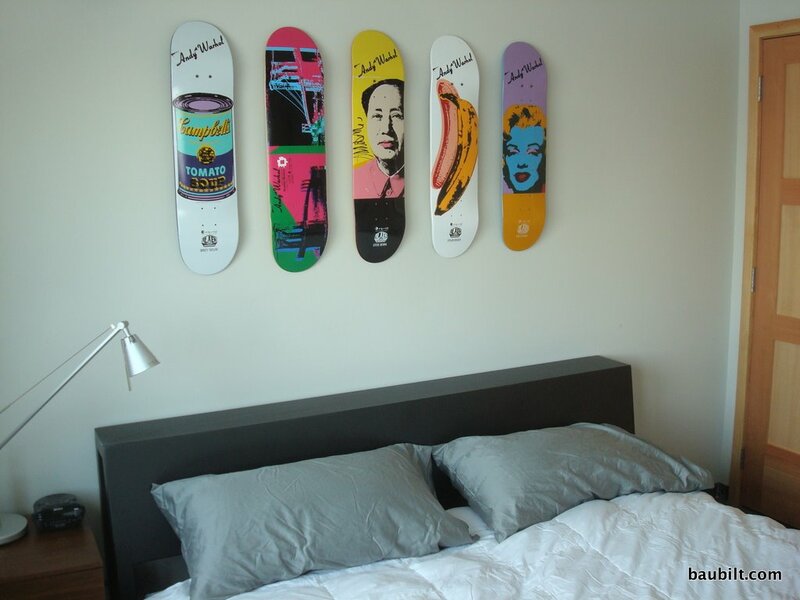 The Warhol skate deck collection. 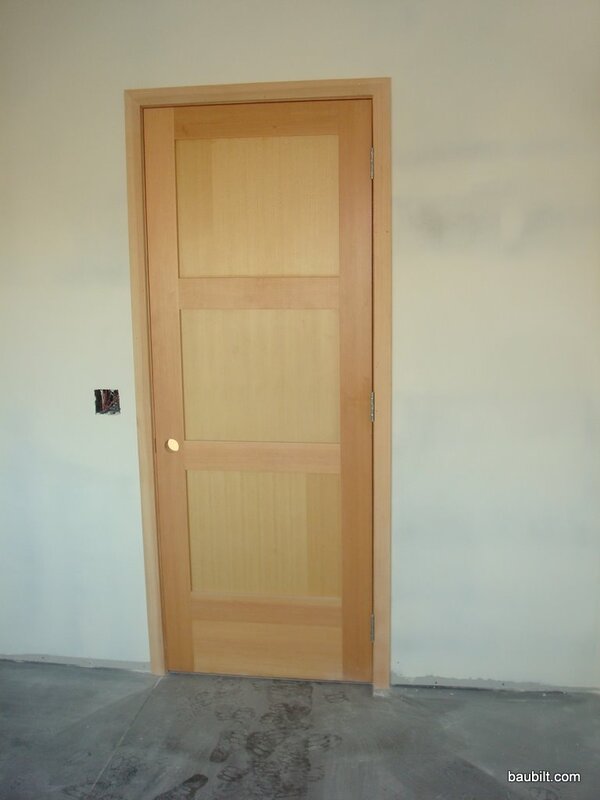 The building materials supplier had promised hemlock stair parts would be delivered two days before our target completion date. 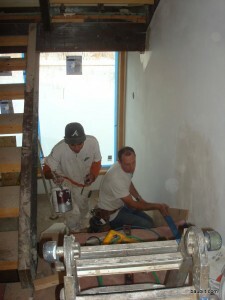 Eric, the finish carpenter, was ready to install the stair in a day. Then, they flaked out on us, saying it would be two more weeks. We needed Plan B.
Eric and Spencer making the parts. They glued up boards to make 12" wide treads. They milled T&G flooring for the landing. 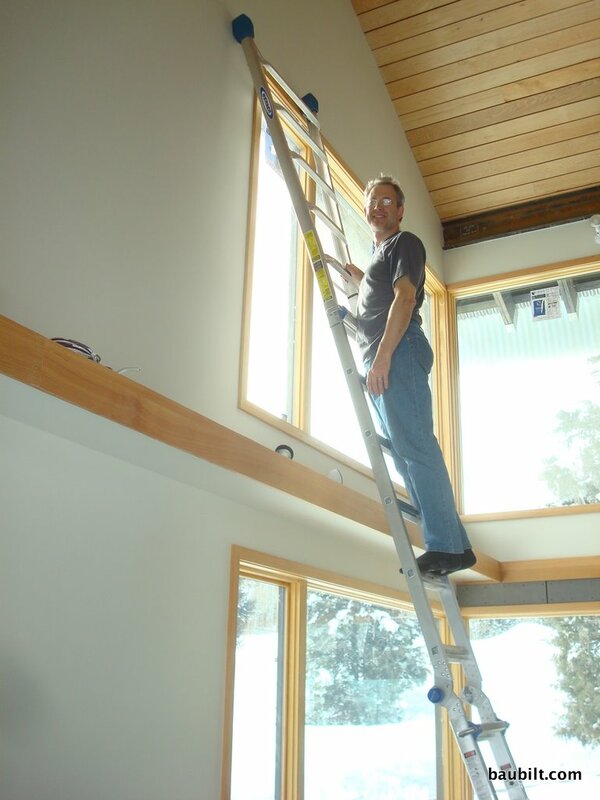 My architects like hanging shelves and I do too. 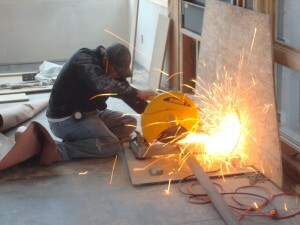 They often take the “cowboy” approach of using galvanized threaded rod and nuts and washers to support the shelving. I wanted something a little more refined, but didn’t want to pay hundreds of dollars for fussy little European hardware bits. Here’s a solution I came up with, which has proven to be excellent in all respects. Excellent hanging shelves, but where do you get that hardware? 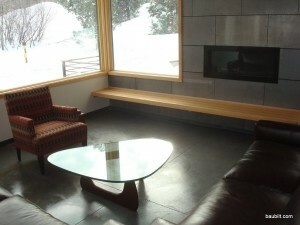 In the Park City house, we have three bedrooms that all are set up nearly identically with wall-mounted TVs. We fed the wires through the wall, but then have the pesky cable box to contend with. I wanted a shallow media shelf of some kind that would accommodate a cable box and a DVD player, but be relatively small and unobtrusive. The main problem with some of the products on the market is that they are too deep. I really wanted something about 11 inches deep, which is plenty for the items to be stored. So, I designed a shelving unit that could be assembled from tubing and flat shelves. Here’s what I ended up with. 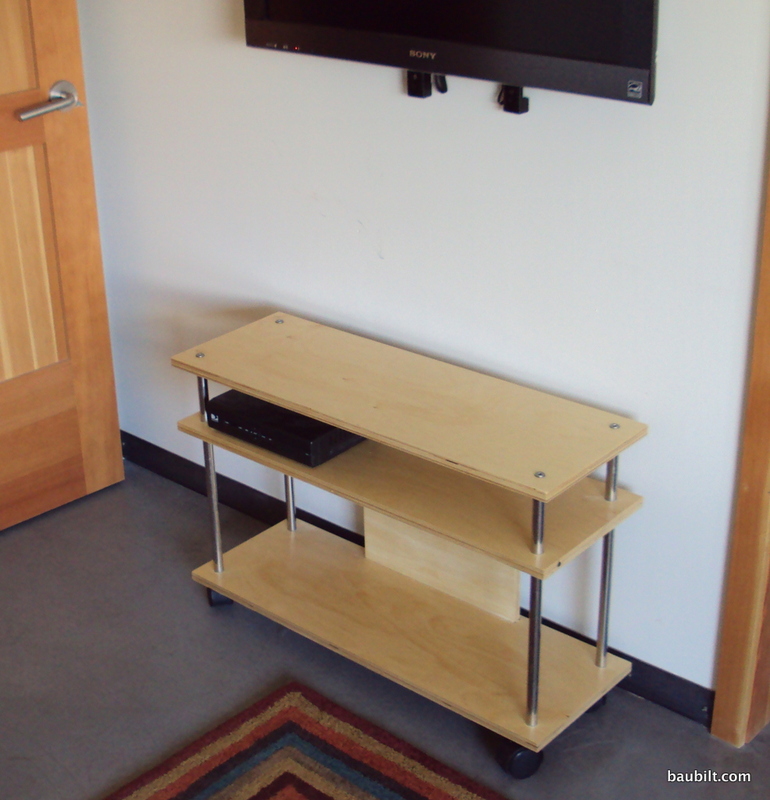 It’s 32″ W x 11″ D x 21-1/2″ H.
The finished shelf unit in place.